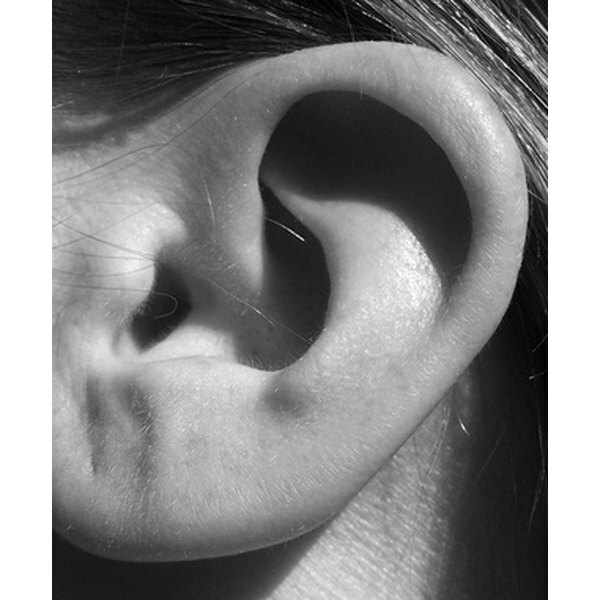 The ear is a complex network of bones, passageways, cavities and fluid, called endolymph, that work together to allow for hearing and the maintenance of balance. When there are changes in the volume of fluid or pressure in the ear, it can result in a feeling of fullness. A change in fluid volume or an increase in pressure may occur as a result of infections, structural abnormalities or a combination of triggers. Meniere’s disease is an inner ear disorder characterized by pressure and fullness in the ear and episodes of vertigo, a spinning sensation. Meniere’s disease develops when the volume and composition of fluid in the inner ear changes in some way. Triggers that may cause this fluid change include physical blockage, allergies, viral infections, head trauma and abnormal immune responses, according to the MayoClinic.com. In addition to ear fullness and vertigo, other symptoms of Meniere’s disease include fluctuating hearing loss and tinnitus, which is a perception of abnormal sounds, such as a ringing, buzzing or hissing. There is no cure for Meniere’s disease, but a number of treatments are available. These treatments include diuretics, motion sickness medications and anti-nausea medications. In severe cases, medications may be injected directly into the inner ear or surgery may be used to correct the physical problem inside the ear. The eustachian tubes are small canals that connect the throat to the middle ears. The function of the eustachian tubes is to regulate air flow, such as during swallowing, yawning and sneezing. A eustachian tube dysfunction occurs when one of the tubes becomes plugged, which causes a blockage and an abnormal flow of air. Eustachian tube dysfunctions are usually a result of excess mucus and inflammation due to an infection, such as a cold, or allergies, according to the American Academy of Family Physicians. Symptoms of a eustachian tube dysfunction include fullness in the ears, muffled sounds, popping in the ears, pain, tinnitus and difficulty maintaining balance. Most eustachian tube dysfunctions relieve themselves when the infection causing them goes away. If the dysfunction does not correct itself, decongestants and antihistamines may be used to help to reduce inflammation. In chronic cases, a device called an implanting pressure equalization tube, which maintains proper ear pressure, may be inserted. Otitis externa, often referred to as swimmer’s ear, is an infection of the ear canal, the opening that carries sound to the eardrums. The infection usually occurs as a result of excess water in the ears, which breaks down the skin in the canal and makes an easy pathway for bacteria or fungi to enter into the body. Otitis externa may also develop when pus from a middle ear infection drains into the ear canal, according to KidsHealth, an information website sponsored by the Nemours Foundation. Symptoms of otitis externa include ear fullness and pressure, pain, discharge and hearing difficulties. Otitis externa is usually treated with eardrops that contain antibiotics. Oral steroids may also be administered to reduce inflammation. In more severe cases, oral antibiotics will be given and pus will be drained from the ear by a physician.